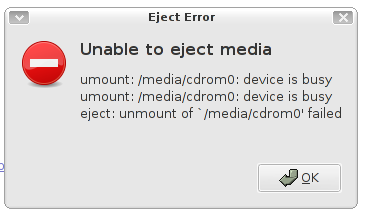 The eject button has no effect at all, the disk mounter applet says can't eject cdrom (see screenshot). 4. Re-insterted the DVD to.. Thanks for your bug. Does it happen with CDs too sometime or only DVD? Does it depend of the content of the DVD? I'm sorry I don't know if CDs do that too, I use/have only DVDs since they are cheaper and faster. I've seen the bug again some day ago by just putting a DVD in the drive, whatching the contents in nautilus, and wanting to eject it. It's not an easily reproducable bug, or I just don't see what realy causes it yet. If you have any idea, let me know and I'll try that. bug #62200 describe a similar issue when using gnome-open-terminal to open a command line from nautilus, do you use that feature too? Yes I have that installed too (on both computers), but I can't tell if I used it when it happened. Will keep my eyes open next time it happens. Timo: sure will do. I just don't use much optical media so it might take a while. About your comment on #62200, actually that's the way I figured out it's nautilus hanging on my mountpoint. I will report back as soon as I see the bug happening again. Timo: I played with it a little and I could eject the disc quite some times in a row (no terminal opened), then I opened the terminal from nautilus and I couldn't eject it afterwards. Don't know if this helps but to me it really seems like nautilus-open-terminal be causing the problem.